This fine and elegant oval relief in walnut wood depicts a mythological theme well-known through an iconographic subject beloved by the Renaissance artists: the Triumph of Galatea. 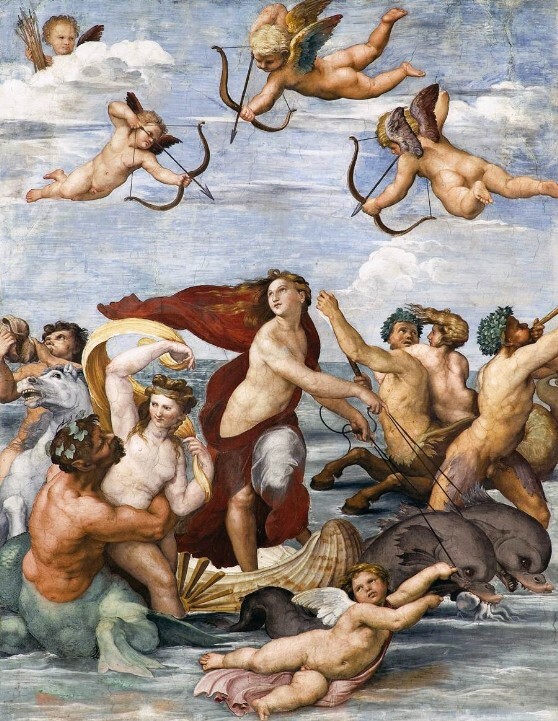 The most famous work depicting the Triumph of Galatea is the fresco painted by Raphael around 1511, for Agostino Chigi at Villa Farnesina in Rome. In Classic mythology Galatea (in greek “the one who has the milk-white skin”) is one of the Nereids – the fifty sea nymphs, daughters of Nereus and Doris – who have the task of assisting the sailors and live with their father on the bottom of the ocean. According to the myth, Galatea was in love with the beautiful Aci. The cyclop, Polyphemus, jealous of the young man and in love with the nymph as well, tried to attract her with the sound of his flute. Failing in his attempt, one day he surprised the loving couple and full of anger, he killed Aci with a huge boulder. Clearly inspired by the mythological tale, our relief depicts a quite rich and eventful scene taking place on a boat pulled by dolphins and with different figures. The nymph Galatea is represented in the act of moving away from a faun playing the panpipes and between two figures, one of them playing the lyre. On the front of the boat, a muscular male figure holding an oar in the athletic effort of rowing, with his face covered by his arm – preventing us from recognizing him – could presumably correspond to Polyphemus. Over the group in the sky, a cupid protruding from a thick mass of clouds is about to shoot an arrow towards Galatea. The high quality of the wood and the choice of the oval shape, together with the sculptural skill displayed in some details like the elegant dolphin heads, allow us to attribute this work to a Franco-Flemish artist, so skilled and sophisticated as to be able to express dynamism and energy – as suggested by the figures cut off at the oval margins – as if the scene might extend beyond the limits of the relief.